There are two of us who run the Little Theatre. The idea of a theatre came to mind in 2008. It all began while making dolls on sticks. 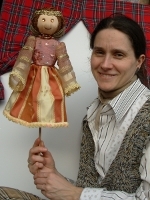 Dolls together with my passion for teaching young children and an actor's aptitude created THE LITTLE ENGLISH THEATRE. I graduated from the Warsaw University, the Institute of the English Studies and French postgraduate studies Master's in The Management of European Economics. I have taught English for more than 10 years. I have 4-years experience of teaching the youngest children (from 1 year old) in Helen Doron linguistic school. I teach two foreign languages, English and French to my two children: Janek and Hania. Education of young children, both linguistic and in a broader sense, is what I like best. I describe my experience in articles. I have a passion and educational background in Roman studies. I graduated from the Catholic Lublin University. After studies I became interested in the education of young children and I began translating children's books. At the heart of my interests there is literature, theatre and education in the broad sense of the word. I am a mother of two creative and bursting with energy school-aged daughters. I enjoy both learning and teaching others. I have an FCE certificate. I worked with a society Closer to the Child which prevents peer violence at school. 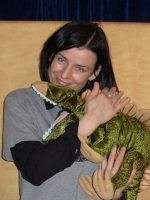 THE LITTLE ENGLISH THEATRE is a way of providing creative education - consent to imagination and a bit of humour in the scope of unconventional foreign language lesson.